In his treatise, De laude novae militiae,l Bernard of Clairvaux distinguished between the Templars and the entire secular knighthood. The first deserved the epithet militia, while the others received the pejorative classification malitia.2 His praise of the “new knighthood” emphasized that its members were the sole knights to behave according to the principles of Vita perfecta, both of the chivalric ideals and of the monastic orders. Moreover, their dedication to a perpetual war against the Muslims and to the defense of the Holy Land was considered by the abbot of Clairvaux to be both the real expression of chivalric ideals, and an achievement of the Gregorian ideas of milites Christi.3 Against this sense of the term militia, the lay knights not only did not deserve to be milites, but, because of their behavior, clothes and hairstyles, which expressed the sins of vanity and luxury,4 represented malitia, or malice. It must be remembered that Bernard, who had been worried by the serious crisis the small company led by Hugh of Payns faced during the first decade after its foundation in 1118, decided, in the spirit of the rule he drafted for the Order, both to comfort them and to help them to recruit new members. Thus, his Praise of the new knighthood was written as a propaganda mani–festo, aiming at the exaltation of Templar virtues and at the “conversion” of the European knights, who were invited to join the new Order in the Holy land.6 His approach was similar to that undertaken in his appeal to the European knighthood urging their participation in the Second Crusade. Certainly, there had been a clear distinction between the “religious” and lay chivalry. The adaptation of monastic ideas by the military orders during the twelfth century, both in the Holy Land and in Spain, led to the emergence of a symbiosis of monasticism and knighthood, previously characterized by Sidney Painter as “religious chivalry”.7 Thus, the basic distinction between “good” and “bad” knights was the result of the long-term evolution of the lay group of warriors, and had no relationship to the establishment of the military orders. This process resulted in the transformation of warriors into a social class, characterized by its own ethical norms of behavior, education, and patterns of culture. It was achieved at the beginning of the twelfth century with the awakening of the consciousness of its superiority within Western society.8 Thus, the violent juvenes of the eleventh and beginning of the twelfth centuries 9 were the same wandering knights as the contemporaries of Wil–liam Marshal; as such, they might qualify for Bernard’s malitia. However, the differing perceptions of the term “malice” in the mind of succeeding generations brought about a change in chivalric ideals, to the point that the approach to the juvenes, considered a social calamity until the first quarter of the twelfth century, was entirely opposite to the attitude towards the wandering knights of the second half of the same century. Among the various factors in this evolution, the qualitative distinction between the “good” and “evil” knights, as expressed by contemporary sources,10 played an important role in the crystallization of public opinion to the transformation of the behavioral norms of these knights. Undoubtedly, such definitions represent the attitude of their authors, all of whom were monks. But they also reflect their implantation among lay society as an outcome of its structure and of “chivalric” education.11 Among the factors considered, the ideas of the Peace and Truce of God played a cardinal role in this distinction, particularly because they became part of the values acquired by the new generation of knights. Accordingly, the question of whether Bernard of Clairvaux invented the distinction formulated in his treatise or used notions already widespread, and adapted them to the Templars, bears special interest. Had it only been an expression of monastic ideas, the distinction between militia and malitia might be qualified as a Bernardine vision of chivalry, related to his spirituality and sociopolitical ideas.12 In such a case, this distinction might be accepted as another expression of the ideas, later formulated in his crusade propaganda. Thus the notion of pax christiana has to be connected both with his crusading ideology, and with his vision of celestial Jerusalem as implemented in the cloister (hic est Hierosolyma),13 reframing Augustinian and Anselmian views. Contrary to any hypothesis which might confine the ideas of peace to the cloisters, the sources reveal that since the middle of the eleventh century such a dichotomic approach to chivalry had largely been spread by public opinion. While the movement of the Peace and Truce of God did not bring about the abolition of wars and violence, it did succeed in implanting in Western society opprobrious feelings against gangs of warriors, condemned as dis–turbers of the public peace and as enemies of the social order.14 Such feeling implied the need for justification of military activities, emphasizing their defensive character as the sole reason for their legitimization. Accordingly, the “good” knights were those who fought in order to protect the churches, the poor and the oppressed. The sources consequently insist on the military activities of their heroes, who, as genuine knights, responded to the appeals of ecclesiastical authorities who were fighting for the freedom of the Church. Moreover, the defensive nature of these wars has been emphasized by attributing responsibility for them to the adversary, an aggressor and offender against peace. Thus, even though wars were considered to be illegitimate in terms of the peace movement, they might have become “just wars” under particular circumstances,15 at least for those who were qualified as “good” knights. In that respect, Suger’s Vita Lodovici Grossi is a mirror of this evolution of chivalric ideals, especially the distinction between the good and the bad. 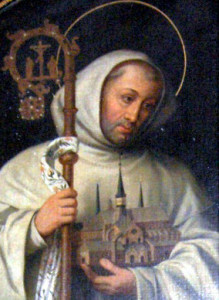 The perspective is, however, different from the Bernardine vision, because Suger had practically no interest in crusading ideas and was less concerned by the needs of the Latin Kingdom of Jerusalem than his friend, Bernard of Clairvaux; moreover, he never showed interest in the military orders. His focus was primarily the restoration of the royal authority in France, a process in which he had been actively involved.21 He distinguished between “genuine” knights, who were engaged in the restructuring of society and the creation of the State, and the “others”, whom he classed as brigands, even though they had been dubbed. Because of his personal involvement in that conflict, Suger’s criticism is bitter, to the point that he did not find any excuse for the conduct of Hugh’s father, even though Everard had been a crusader and was killed at the siege of Antioch and accordingly deserved the remission of his sins. 1. Bernard, De laude, in: Bernard, Opera, vol. 3, pp. 213-240. 2. Bernard, De laude, ch. 2, in: Bernard, Opera, vol. 3, p. 216. 3. See: Robinson, “Gregory VII”, and Leclercq, Nouveau visage, s.v. 4. Bernard, De laude, ch. 2, in: Bernard, Opera, vol. 3, p. 216. 5. Some examples of a broader use of this dichotomy may be found in Bernard’s sermon, such as: Sermones in laudibus Virginis Mariae, Homilia IV, 10 (Bernard, Opera, vol. 4, p. 56); In Psalruun qui habitat, Sermo V, 2 (Bernard, Opera, vo1. 4, pp. 402-403); In Dedicatione Ecclesiae, Sermo II, 4 (Bernard, Opera, vol. 5, p. 378); and In Natali Sancti Victoris, Sermo II, 5 (Bernard, Opera, vol. 6, p. 36). 6. This conclusion results from a comparison with Bernard’s letter addressed to the Templars (see: Leclercq, “Templiers 1”). 7. Painter, ch. 3: “Religious Chivalry”. Since the publication of this book, significant progress has been made in research in that field. The proceed–ings of the 1979 Reichenau conference (Fleckenstein) opened new perspec–tives on this topic. For the linkage between “secular” and “religious” knighthood, see: Winter, Rittertum; Keen. 8. See: Wolff, “Eveil”; Duby, “Societes”. See also: Duby, Bouvines; Duby, Marriage. 9. See: Duby, “Socidtds”; Duby, “Origines”. 10. See: Cardini; Flori, Glaive, pp. 158-65. 11. For trends of monastic historiography, see: Ambroise, s.v. On “chivalric” education, see: Rich; Orme. 12. See: Leclercq, Nouveau visage; Sommerfeldt. 13. Bernard’s De conversione, ad clericos sermo seu liber. (Bernard, Opera,vol. 4 (1966), pp. 69-116) should be considered as part of his polemical activity against Abelard and his Parisian students and must be interpreted in that context (Grabolfs, “Quartier Latin” [rpt. with the same pagination in: Grabois, Civilisation, ch. 71). On the other hand, it expresses in a broader sense Bernard’s views on the celestial Jerusalem (Konrad; Bredero). 14. See: MacKinney; Bonnaud-Delamare; Hoffmann; Cowdrey, “Peace & Truce”; Renna. 16. Raoul Glaber, p. 129. In this context, similar attitudes had been adopted and expressed by Gerard of Cambrai and Adhemar of Chabannes, enlarging thus the geocultural area where such ideas prevailed to northeastern and western France; see their analyses by Duby (Trois ordres, pp. 35-61, 168-74), as well as Flori (Glaive, pp. 137, 161-63). 17. See: Johrendt; Van Luyn; Batany. 18. Gesta Guillelmi, pp. 154, 182-84. See: Douglas, pp. 185-88; Brown, Normans, pp. 145-51. 19. The Chron. de Morigny (2nd ed.) uses such stereotypical qualifications: King Louis VI is described as the ideal knight (p. 11), while the troublemakers deserved malicious terms, such as Robert of Oinville, “a malicious warrior” (p. 14), or Hugh de Crdcy, “an impious knight” (p. 22). 21. The autobiographical references included in Suger’s works are the best source testifying to his activity (see: Misch, vol. 3, pp. 318-23). 22. Suger, Vita Ludovici (1964), p. 90. For the general trend of this evolution, see: Hunt, Paterson, and particularly, Flori, Chansons. 23. For the genealogy of the family, see: Dion; for the participation of its members in the crusade and their role in the new Latin Kingdom of Jerusalem, see: La Monte, “Le Puiset”. 24. Suger, Vita Ludovici (1964), p. 130. Suger’s personal involvement in this conflict caused him to deal at length with this story (see pp. 128-70). 25. See: Chaurant, with a good bibliography. In the late thirteenth century Thomas became the hero of a popular epic, La Chanson de Jerusalem. On his literary image, see: Durparc-Quioc, “Coucy”. A revised and up-dated version of this article was included in Durparc-Quioc, Cycle, pp. 39-44. 26. Suger, Vita Ludovici (1964), pp. 174-76. 27. Suger, Vita Ludovici (1964), pp. 30, 176. See similar qualifications by Guibert of Nogent, who was well informed about Thomas’ conduct on the crusade and in Picardy (Guibert of Nogent Vita, p. 160). See also the English translation in: Benton, Guibert of Nogent, pp. 184-88, with notes by the editor. 28. Suger, Vita Ludovici (1964), p. 176. See: Winter, “Cingulum militiae”; Flori, “Adoubement”; Flori, “Chevalerie”. 29. See: Morris, “Equestris Ordo”. 30. Bernard’s Letter 221, addressed to King Louis VII (PL, vol. 182, cols. 386-87). See: Pacaut, Louis VII, pp. 42-4 and Grabois, “Louis VII”. 31. See: Constable, “Second Crusade”; Willems. 32. Among the various studies, see: Barber, Knight, Keen. This entry was posted in Articles and tagged 11C, 12C, Bernard of Clairvaux, chivalry, Crusades, High Middle Ages, Monasticism, Second Crusade, Spain. Bookmark the permalink.